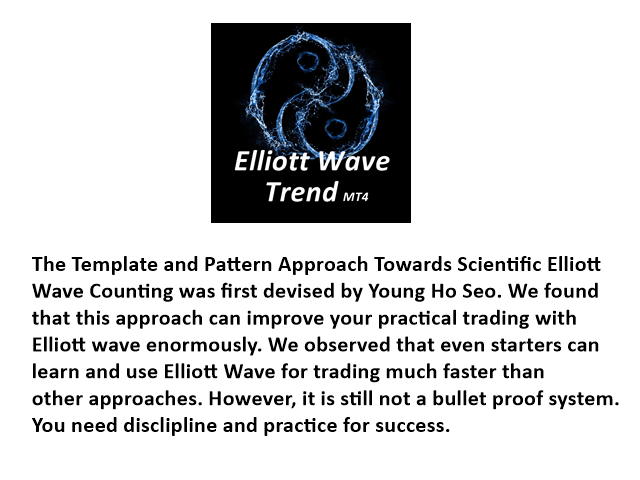 Elliott Wave Trend was designed for the scientific wave counting based on the template and pattern approach first devised by Young Ho Seo. 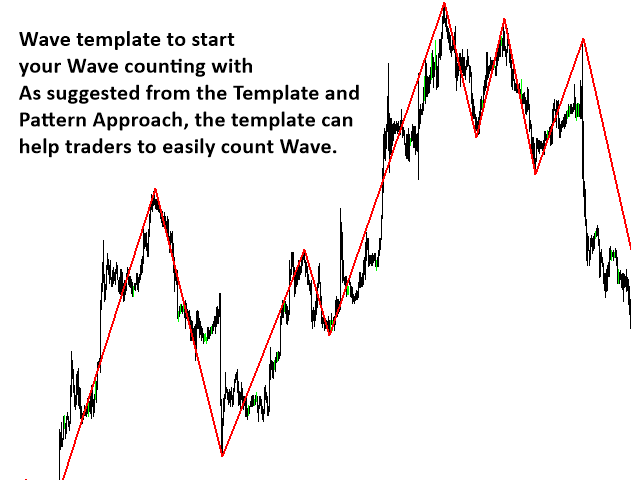 This tool focuses to get rid of the vagueness of the classic Elliott Wave Counting using the guideline from the template and pattern approach. 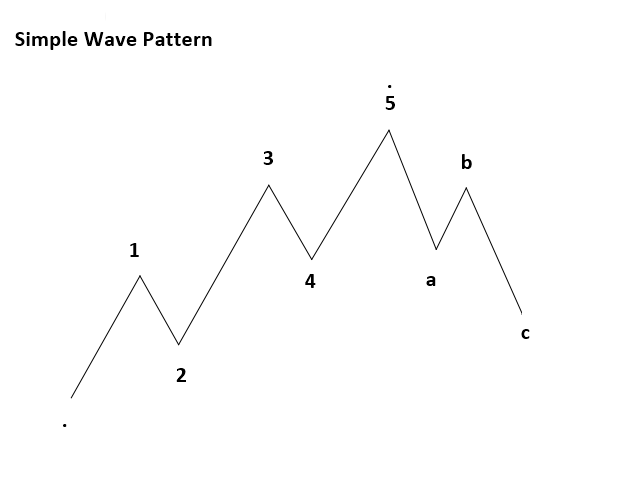 In doing so, firstly Elliott Wave Trend offers the template for your wave counting. Secondly, it offers Wave Structural Score to assist to identify accurate wave formation. It offers both impulse wave Structural Score and corrective wave Structure Score. Structural Score is the rating to show how good your Elliott Wave pattern is. 100% means that it is good wave pattern. The score below 80% or negative values means that you might have some mistakes in your analysis. 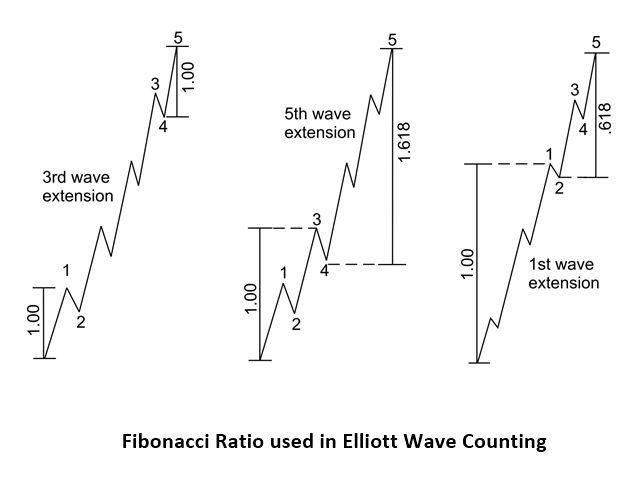 Elliott Wave Trend will correct some obvious mistake in your wave counting if the counting goes against the three Wave rules proposed by Ralph Elliott. 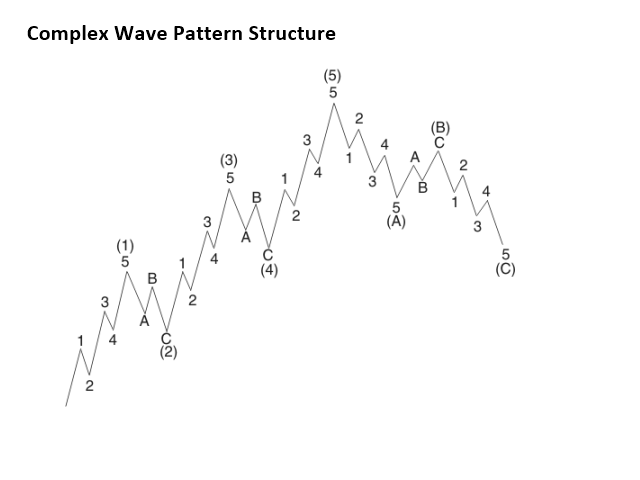 Please note that even though there are many automatic features inside Elliott Wave Trend, some manual operation is still required for your wave counting. 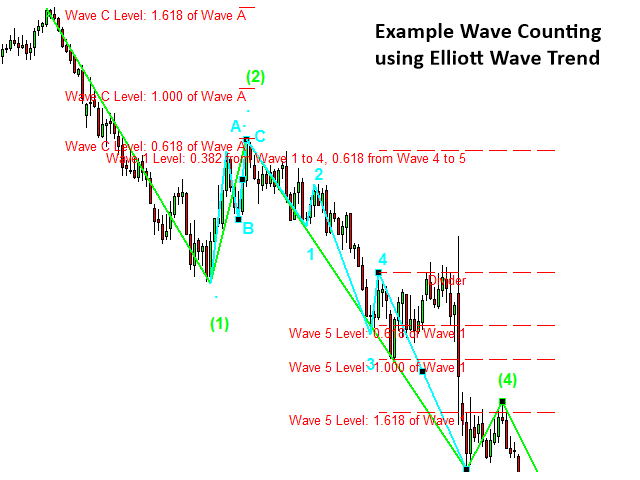 In addition, you will need some discipline and knowledge in Elliott Wave counting. Once you have them, you will be able to use the full power of Elliott Wave trading, where the subjectivity is fully controlled in your wave counting. Our Elliott Wave Trend operate mostly with button and mouse clicks. 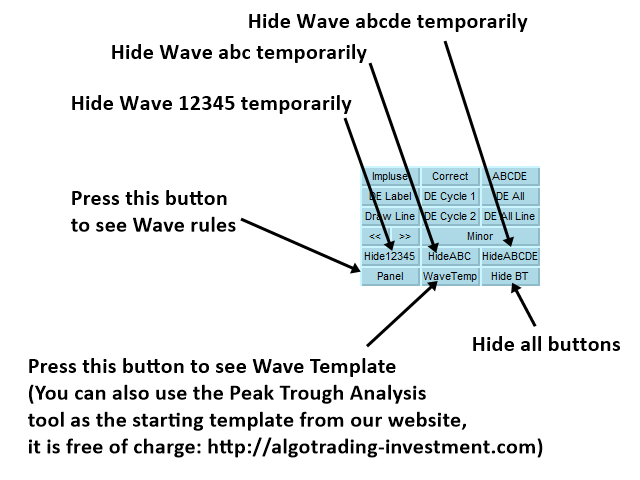 Here is the list of buttons you can use to identify accurate Elliott Wave patterns from your chart. Impulse: Press this button first to start labeling impulse waves on your chart. When this button is off, you can’t label any impulse wave in your chart. Once this button is pressed, then double click in your chart to label each impulse wave (i.e. wave 1, 2, 3, 4 and 5). When you finish labeling for impulse wave, just release this button again. Note that in your first double click, origin (.) of your wave will be marked. After that, label 1, 2, 3, 4 and 5 will follow. 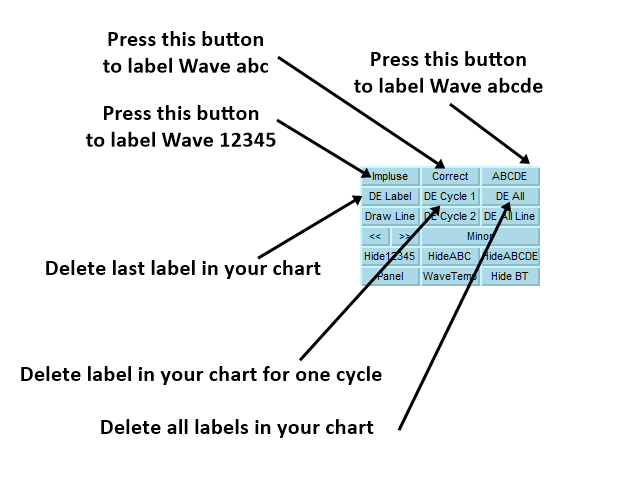 Correct: Press this button first to start labelling corrective waves on your chart. When this button is offer, you can’t label any corrective wave in your chart. Once this button is pressed, then double click in your chart to label each corrective wave (i.e. wave A, B and C). When you finish labeling for impulse wave, just release this button again. Note that in your first double click, origin (.) of your wave will be marked. After that, label A, B and C will follow. Panel: Press this button to show and hide the information panel. 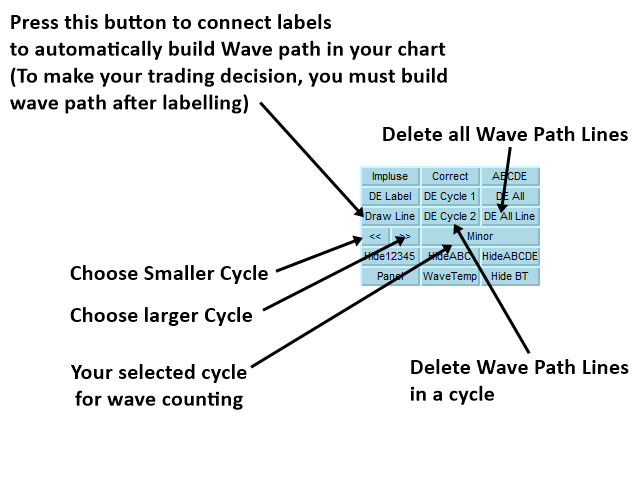 The information panel provide you the three Elliott Wave counting rules. 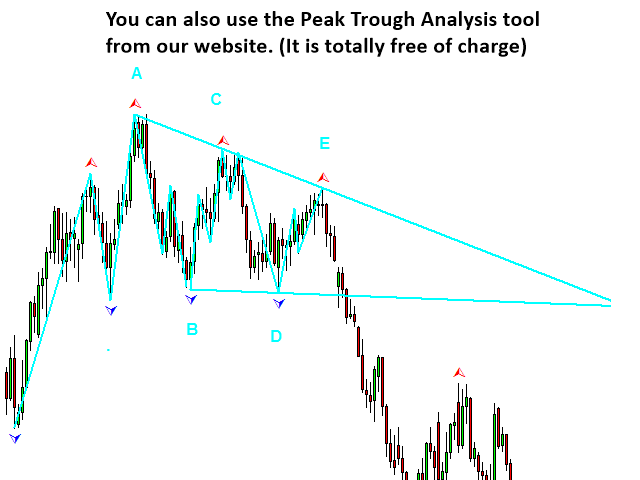 WaveTrend: Press this button to show and hide the trend indicator in your chart. You can use this trend indicator to assist for your trading. Outstanding tool for counting waves. A must buy. Perfect tool to count wave. Very good trend indicator. I can get good settings for most of currency pairs plus many winning trades so far. In version 10.6, Elliott Wave Trend can scan Turning Point Strength for multiple timeframe (MTD = Multiple Timeframe Pattern Detection). Please note that MTD can take heavy computation and it can slow down your MetaTrader and your computer. In version 10.1, you have all types of the template shown instead of 1 type of templates. In Version 9.7, user can save and load the wave counting. In Version 8.1, we have made a really small change. In version 8.0 we have omitted Wave template feature for some reason. Now we have put the wave template feature again in our version 8.1. This is a really minor change and it does not affect most of you. 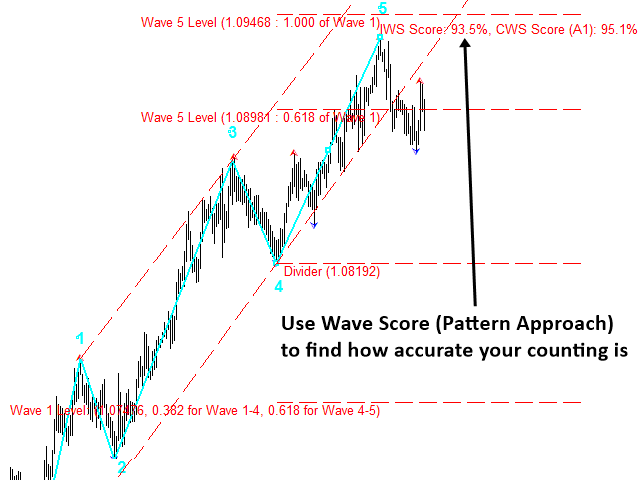 In version 8.0, you can label ABCDE wave pattern. The automatic feature involves drawing the ABCDE envelop line for your own convenience. In Version 7.3, We have added Invalidation Check Box for Wave 2 and Wave 4 and We have added the range defined for flat and triangle corrective wave. We have made a minor update in our Elliott Wave Trend for Version 7.0 from previous version 6.8. Instead of showing only Impulse Wave Structural Score, we show both Impulse Wave and Corrective Wave Structural Score. When you identify impulse Wave (trend), Impulse Wave Structural Score must be greater than Corrective Wave Structural Score, or at least the Impulse Wave Structural Score must not be marginally smaller than Corrective Wave Structural Score assuming Impluse Wave Structural Score is greater than 80%. In version 6.8, we have made quite a lot of changes to our Elliott Wave Trend. Therefore, we have changed quite a lot of our product description too. Overall, we made quite a lot of automation performing the analysis techniques of Professional Elliott Wave Traders in version 6.8. Fully automatic labelling feature and channelling techniqures are also added to our version 6.8. 1. "Save" button: Now user can save the best parameters. So once he saved the best parameters, every time, he load chart, he will see the best parameter setting. If you want to remove the best parameters sets. Simply open MQL4 (or 5) Data folder, then open Files folder and then open "EWT" folder. All the save parameters are located here. If you delete these files. Elliott Wave trend will not load these parameters any more. 2. "BT" button: now user can click "BT" button to remove all the buttons from your chart. It is good if you want to have more space on your chart. 3. More improved prediction and wave detection engine. 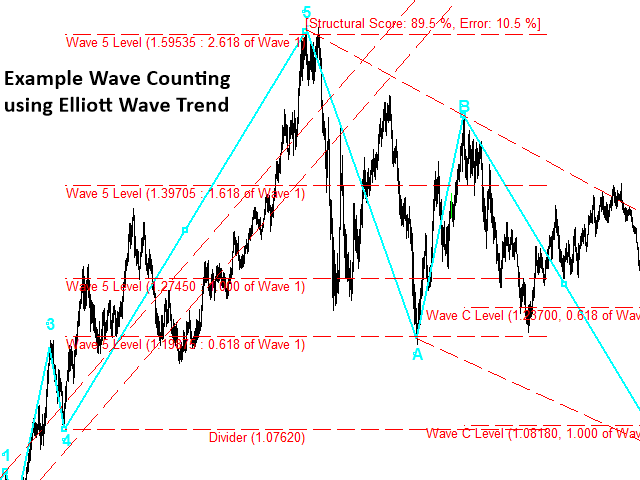 Comparing to previous version, now Elliott Wave Trend tools are more accurate and use less computation.